Jim Teeny has had more success in heavily fished waters than any steelheader you can name. Learn his unique techniques for spotting, stalking and hooking steelhead under the most challenging situations. Whether you fish the often super clear rivers of the West Coast or the heavily fished tributaries of the Great Lakes, Teeny’s techniques will work for you. 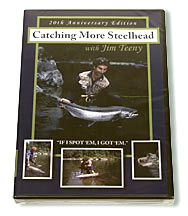 This video won the 1988 Teddy Roosevelt award for “The Best How-To-Video for the Nation” from the Outdoor Writers Association for it’s totally visual approach to the techniques of catching steelhead. Book, "Fly Fishing Great Waters"